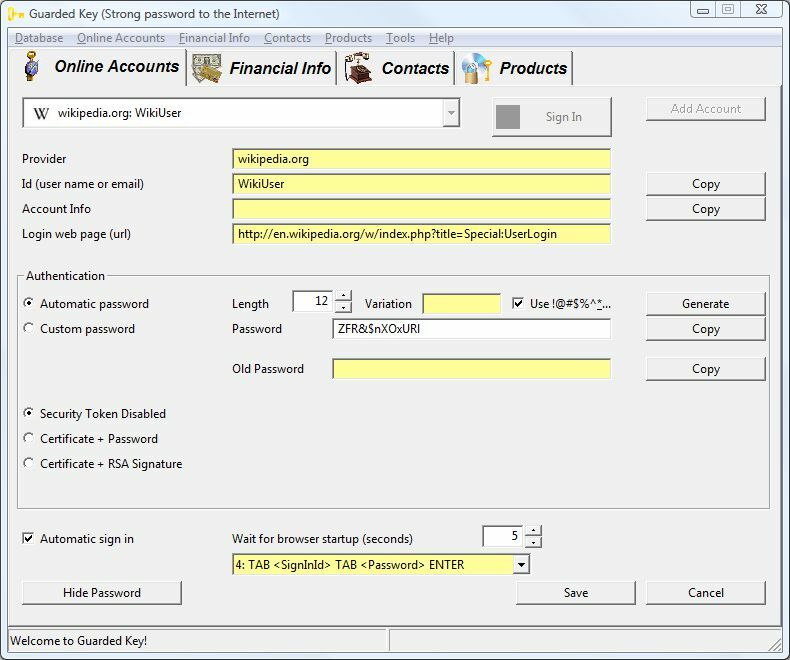 When Guarded Key launches default web browser, it needs to wait until the browser loads web page before it can enter id and password. You need to specify how long should the application wait for browser. On most of today's computers 5 seconds is adequate delay and this is also default value. However if you have slower computer, you may need to increase this value to 10, 20 or even 30 seconds. To be sure that browser starts you may need to increase time. This is true especially after computer reboot or cold start. However instead of increasing time, say to 10 seconds (I think this is too much to wait) there is a trick which can help you. Before clicking on an account to sign in, you should start your default browser. When the browser is initialized, it doesn't take much time to load a web page. Now you can select online account to sign in automatically without unnecessarily long delay. Note: Some web sites may still need increased time, because they redirect users from a page to page before reaching page for login. 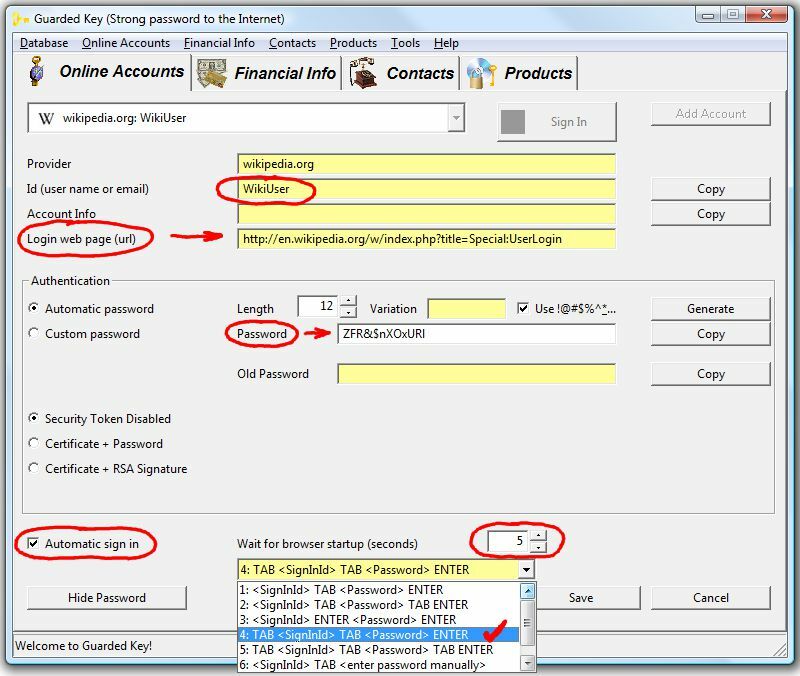 Sign in sequence defines what you need to do on login page. When loading login page, most web sites place focus on sign in Id and pressing TAB moves cursor to password text box. ENTER key then submits the page. This sequence of key presses is set as default value for Guarded Key. If web site requires different sign in sequence, you can select the one that is appropriate. 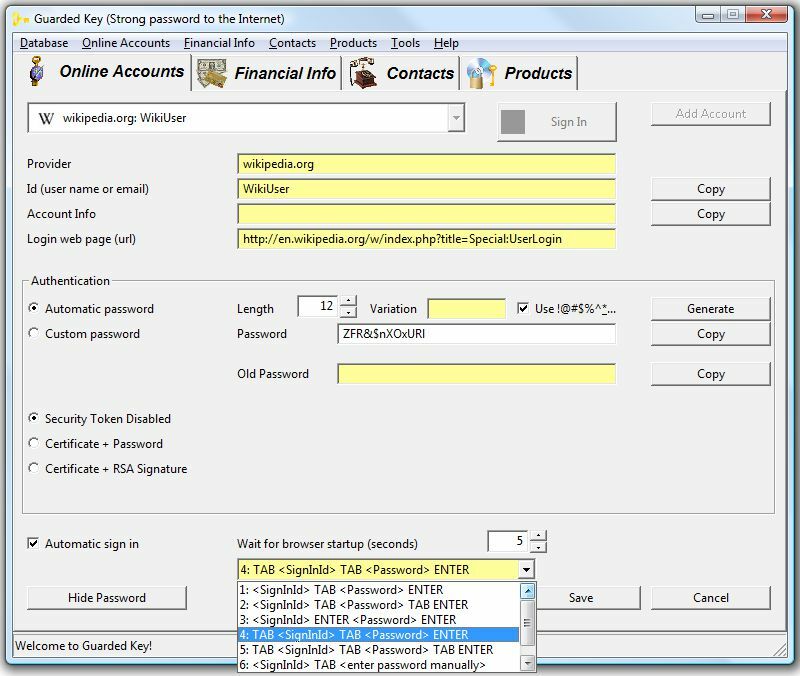 Despite of all these options, there are web sites which require mouse click or several TAB presses (even more than 20) in order to place focus on sign in id. There is not much we can do here. It is simply bad web design. However we can use trick: set delay to 10 seconds and sign in sequence set to option 1. When the page is loaded, you can click mouse pointer on Id text box and Guarded Key will do the rest. Well done. Now you have millions of web sites just waiting for you to sign in.